Nachos in a crock pot? Um...okay. At least that is what I was thinking when I first came across the recipe on the Betty Crocker website. Seemed kind of different, but I wanted to try it. I do love my crock pot so I am willing to try just about anything in it! I did adapt the recipe slightly, but all in all it was a success. A huge hit with the hubster and oh so yummy! 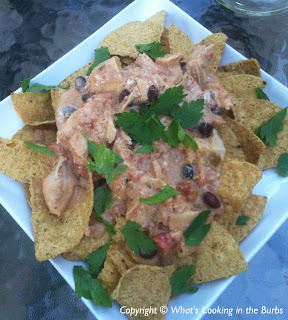 Place cheese, salsa, beans, rotel, and chicken in crock pot. Cover and cook on Low heat 4-5 hours, stirring halfway through cooking, until cheese is melted and chicken is fully cooked. Break chicken into chunks and stir in sour cream. Increase heat setting to High. Cover and cook about 20 more minutes or until mixture is hot. Serve over tortilla chips. NOTE-Topping will hold on Low heat setting up to 2 hours; stir occasionally. Can't wait to give this a try. Looks really good!